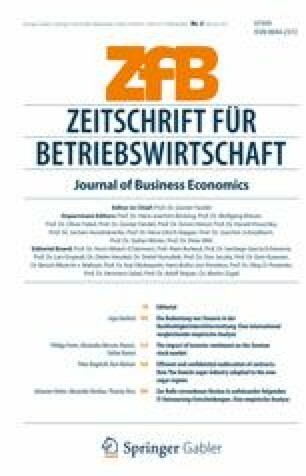 This paper develops a broad-based sentiment indicator for Germany and investigates whether investor sentiment can explain stock returns on the German stock market. Based on a principal component analysis, we construct a sentiment indicator that condenses information of several well-known sentiment proxies. We show that this indicator explains the return spread between sentiment sensitive stocks and stocks that are not sensitive to sentiment fluctuations. Specifically, stocks that are difficult to arbitrage and hard to value are sensitive to the indicator. However, we do not find much predictive power of sentiment for future stock returns. Percent, number of calls traded divided by number of puts traded. Million EUR divided by number of firms; trend adjusted as in Andersen (1996). All macroeconomic variables are computed as month-over-month changes based on 12-month-moving-averages of the underlying index variables. Excess market return over risk free rate. Return difference between portfolios of small and large firms. Return difference between portfolios of high and low book-to-market equity firms. Return difference between portfolios of high and low return momentum firms.